Did McCain catch up? I found him incredibly unappealing. He seems like a very small man, in all respects. He played to his radical right base. He knows that getting out their vote is the only way he can win, since he has lost with independents and all other women outside the base. I'd bet even Joe the Plumber is voting for Obama. Update: The CNN focus group of undecided voters in Ohio say Obama won and three decided to vote for him tonight. Ayers didn't resonate with the group. The third and final debate between Senators Barack Obama and John McCain begins at 9pm ET on CNN. Big Tent Democrat, TChris, the TL Kid and I will be live-blogging. The live blog stays below the fold so that it can be a bit wider than the front page allows. Just click on the "There's More" button or bookmark the permalink to go directly to it. You can comment same as always in the comment section below. You also can send us live messages through the software. Only comments you post below will appear on the site. Pre-Debate Thread: What Will McCain Try Now? The final debate between Sen. Barack Obama and John McCain begins in less than two hours. What will McCain do? Will he stay on issues or make a last minute sleaze attack on Obama? How will Obama respond? How should he respond? 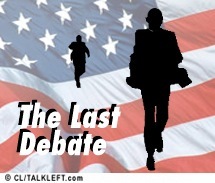 We'll all be here to live-blog the debate -- Big Tent Democrat, TChris, the TL Kid and me -- hope you will join us. In the meantime, here's a place for your last minute debate thoughts.